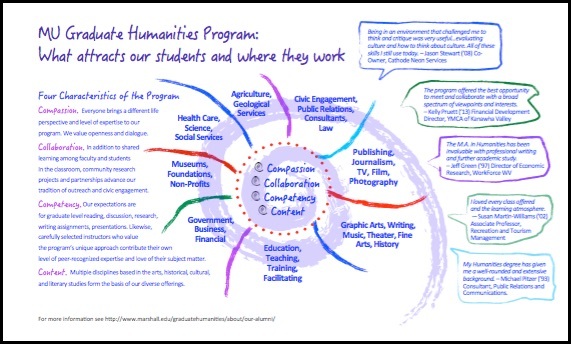 Since 1979 when the Program was established at the West Virginia College of Graduate Studies, Graduate Humanities students have come from varied backgrounds: teachers, engineers, English majors, business leaders, healthcare workers, librarians. Among our graduates you’ll find freelance writers and editors, K-12 and collegiate educators, television and radio professionals, photographers, artists, folklorists, museum professionals, and many others. We are currently compiling a complete list of our alumni over the past 30+ years – what appears below is a developing list and we will update it as we gather further information. If you would like to update your profile – or have information to help us update the list below – please contact our Program Assistant, Trish Hatfield. Now appearing in alphabetical order . . .
2010 Title of Thesis/Project: “Glenwood Inventory Project.” (Cultural Studies/Appalachian Studies) Where today? Ashley is pursuing a 2nd Masters (Education) at Marshall University Graduate College South Charleston and is student teaching at Andrew Jackson Middle School. 6th Grade English. (Last Update: 2013) What did you value about the program? “The Marshall Humanities Program revitalized my faith in education. Yes, I realize that sounds cliché. Overly romanticized. But it’s completely true. In the Humanities Program, people weren’t concerned with the competitiveness of academia- they were concerned with me and my goals. I have never felt more encouraged in my academic pursuits. I also met a diverse group of people. Vastly intelligent. A well-traveled bartender with a love for Dostoyevsky. A computer-savvy servicewoman. A PR rep. Teachers, students, parents, retail workers. I grew so much in my understanding of the diverse human experience through listening to others tell their life stories. All coming together for the same goal. Much like the humanities themselves. I learned about the importance of connections across the disciplines. How it’s less important for your writing to sound smart than it is for it to be written clearly. I am currently employed at a local historic house because of connections I made through the program. I also am in the last stages of getting my teaching certification. If I hadn’t gotten my MA in Humanities, I definitely would not be where I am now. I would not have regained my faith in the educational process and would not have continued. It is a learning experience that has forever changed my life. 1987 Title of Thesis/Project: The Writer and His Audience.” Where today? Nancy is retired. She taught English to college freshman. (Last Updated: 2006) What did you value about the program? “My Humanities degree gave me a well-balanced background in the arts and literature. It has also aided in all I have done professionally and personally. 1997 Title of Thesis/Project: “Mother-Daughter Relationships in Irish Novels.” (Cultural Study through Literature) Where today? Betty has been the director of the West Virginia Center for Civic Life since its founding in 1998. A primary focus of her work has been building a network of public dialogue in the state through collaborative partnerships with educational, civic, faith-based, and governmental organizations. (Last Updated: 2015) What did you value about the program? I appreciated the flexibility the Humanities Program allowed in developing a concentration of courses in my area of interest – Irish Studies – made possible through the leadership of Dr. Joyce East. The opportunity to explore this field through in-depth interactions with dynamic students in small classes was especially valuable. 2004 Title of Thesis/Project: “Original Songs about the Allegheny Frontier.” (Historical Studies) Where today? Pete teaches history at South Charleston High School and is on the teaching staff for Allegheny Echoes. (Last Updated: 2013) What did you value about the program? “It’s what you want to get out of it–I needed a Master’s degree for my teaching certification which gave me a raise but it was a very enriching experience. My emphasis was on historical studies and I was learning more about history, which I teach. My final project included recording a collection of songs that I wrote about the Allegheny Frontier.” For an interview with Pete about his singing and songwriting, see Fall 2012 Graduate Humanities Newsletter Vol. 35, Issue 2. 1995 Title of Thesis/Project: (Literature and the Arts) Where today? William teaches Humanities at the West Virginia Community and Technical College as Adjunct Professor. He is also Public Safety Officer at the college. (Last Updated: 2006) What did you value about the program? “My degree allowed me to teach, which I love to do. I believes the degree allows me to teach the full picture to my students. 2009 Title of Thesis/Project: “Constellations: An Anthology of the Marshall University Graduate Humanities Program Celebrating 30 Years (1979-2009).” Where today? Katie is a Graduate Admission Counselor. 2008 Title of Thesis/Project: “Daniel Boone: A Comic Strip and a Cultural Connection to Appalachia.” (Arts & Society) Where today? Angelica returned to Cali, Columbia where she owns a chemicals consulting business, Insumos Industriales J.J., and co-directs Alcanzarte, an art gallery with classrooms for teaching. (See Angelica’s work and resume http://alcanzartetallerygaleria.blogspot.com/p/las-artistas.html) (Last Updated: 2013) What did you value about the program? “Understanding of cultures, improving my visual capabilities for communication. Getting to know valuable people. The program gave me: (1) respect for others, it’s amazing what handling language can give to you; (2) understanding of who I am and what I want; (3) happiness – I am way more happy than before because I make better use of my time, I am a better professional, I do a better job of communicating; and (4) I am a better teacher because I have tools and I am more open–minded. Humanities is everything we do; but we are not aware of it – that’s why it’s so difficult to talk about.” For more on Angelica Tovar, visit www.marshall.edu/wpmu/graduatehumanities/newsletter for a full interview. 1980 Title of Thesis/Project: “Harriet Hosmer: The Roman Years: 1852-1864.” Where today? (Dolly has passed on.) What did you value about the program? Harriet published the book, “Harriet Hosmer: American Sculptor 1830–1908” in 1991 that was, to the best of our knowledge, begun or augmented while she was in the Humanities program. According to the book cover, Harriet wrote extensively on topics in the humanities, particularly American cultural history and the decorative arts. 2008 Title of Thesis/Project: “The Magic Glass Changer and the Paper-Heart Boy” (Cultural Studies) Where today? Jason is a partner in the family business, Cathode Neon Services in Seymour, Tennessee. (Updated 2013) What did you value about the program? The writing. I love to write and the program expanded my ability to write. Also the artistic aspect did the same. I gained critical thinking skills – being in an environment that challenged me to think and critique was very useful…evaluating culture and how to think about culture. All of these skills I still use today.